Today’s recipe is a favourite of mine and my hubby! He usually doesn’t like courgettes Mexican style, which I love, but he likes soups, so I came with the amazing idea of doing create something that we both like and this is how this creamy soup came along! 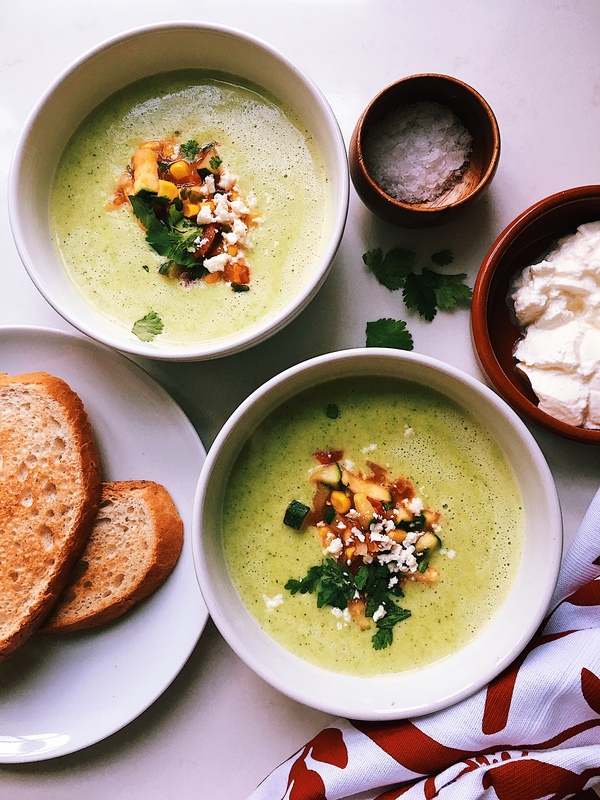 It is great for children as well, my two little pollitos love it very much and to let people know what they are eating, I garnish the soup with proper Mexican style courgettes and some yummy feta. Since the New Year started all I fancy is comfort food, I wonder if it is because the weather in London is freezing cold! Anyway, I am sure it is just fine. 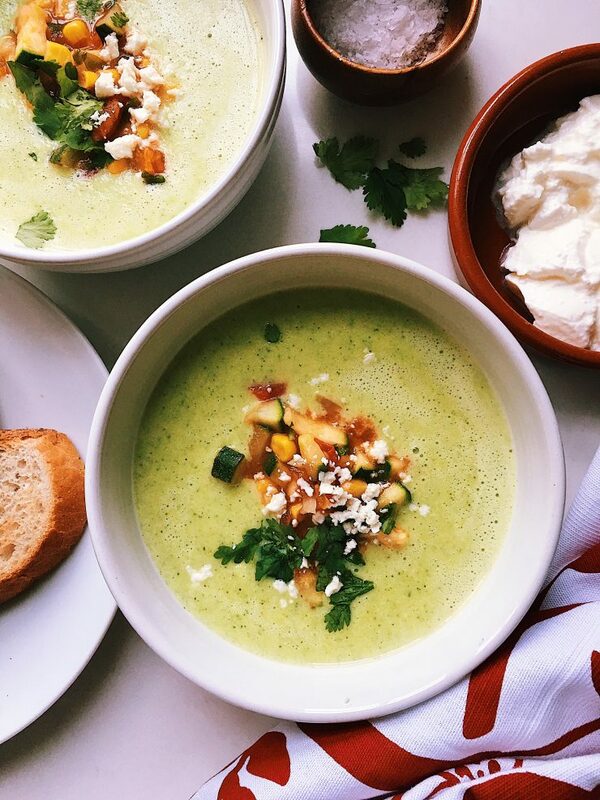 This creamy soup recipe is to make four servings, but if you want to make it for more people just add one courgette per person. You can have it as a quick lunch with some toast or as a starter for a dinner party! Heat a large saucepan to medium heat and add the butter and oil. Once the butter has melted add the onions and garlic. Fry the onions for 3 min then add the courgettes and frozen sweetcorn. Fry them for 5 min. Add salt and pepper. Then add the two tbsp of plain flour and continue frying to get rid of the raw flour taste. Then add the water and milk. Bring it to a boil and transfer all the vegetables with the liquid to a blender and blend until smooth. Once it is blended, transfer the soup back to the saucepan and continue cooking until it comes to a boil. Cover and set aside. Then make the proper Mexican style courgettes to garnish the soup. Heat another saucepan and add the knob of butter and oil. Once the oil is heated add all the vegetables (courgettes, tomato, onion, coriander, frozen sweetcorn), water, salt and pepper. Cook at medium low heat for 10 min or until the courgettes are soft. Serve in a bowl. 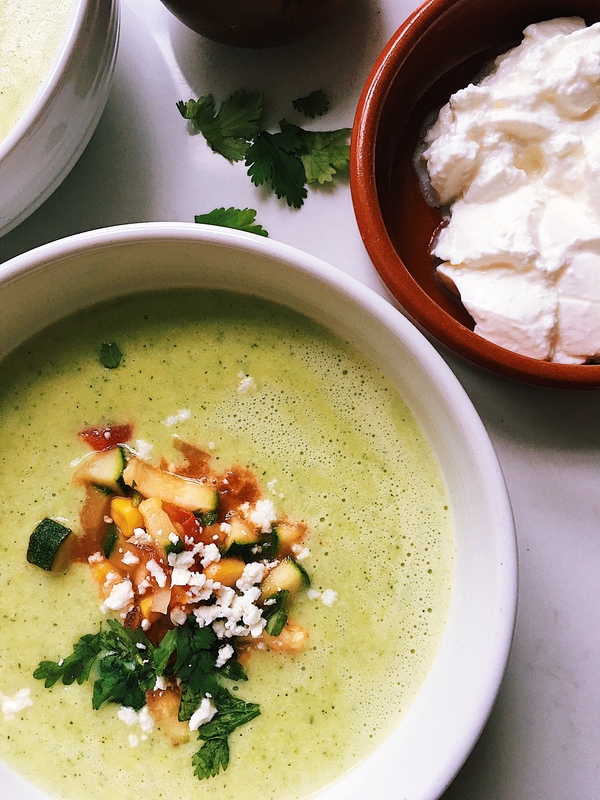 Pour some of the soup and then garnish with the Mexican style courgettes and sprinkle some feta to finish it off and to add more flavour. Enjoy it with a nice piece of bread.